ONE OF the most commonly misunderstood concepts of stroke fundamentals has to deal with the follow-through. Whenever a student asks me whether his follow-through is too short or too long, the first thing I tell them is always the same: Your cue stick should come to a natural stop after a certain amount of time. What this means is that your follow-through should be a natural result of your stroke. It only makes sense, right? The longer, faster backswing needed for a powerful shot will result in the cue hitting the cue ball with more speed. As the cue begins to decelerate after contact, it will take more time and space when it's moving at a higher speed. So there is a relationship between the length of the backswing (before contact) and the follow-through (after contact). But it's not as simple as a 1-to-1 ratio. For any shot with medium speed or more, I recommend using a full backswing. But remember, the harder you hit the cue ball, the farther your cue will travel after impact. With developing players, though, a common problem arises when they have to hit a shot harder than what is comfortable. Instead of using a smooth, loose stroke, you might have a tendency to tense up when you have to hit the cue ball with power. If this occurs, your cue is likely to go off center. When your cue strays from the shot line, you'll run into problems with mishits and off-center hits. Basically, your cue ball will start to wander. But there's an easy exercise to keep yourself in check. 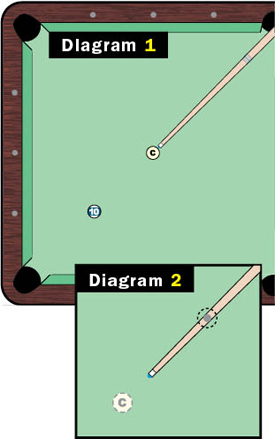 In Diagram 1, the cue ball is on the foot spot with the 10-ball halfway to the pocket. Obviously, this shot isn't tremendously challenging, but you're only concerned with the cue stick before and after the shot. Hitting the cue ball in the direct center, pocket the 10-ball in the corner with a medium stroke. You should finish in a position like the one shown in Diagram 2, where your cue is directly over the foot spot. As long as your cue remains over the foot spot, slowly increase the power of each shot. If you continue to finish your follow-through in a dead straight line, you're right where you should be. If you are swaying, slow things down and check your fundamentals.